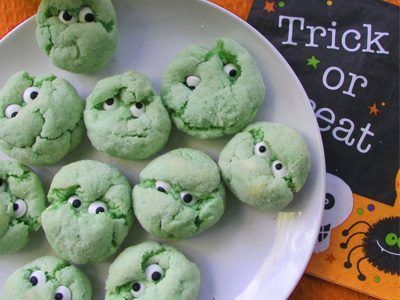 These cookies are so chewy and delicious and so much fun for Halloween! When baking with STAR Extra Light Olive Oil make sure you use our conversion cart. Beat STAR Extra Light Olive Oil, vanilla, egg and cream cheese until fluffy. Mix in cake mix. Add green food coloring until it’s the color you want. Chill for 30 minutes. Roll into balls in a bowl of sugar. Place on a prepared cookie sheet. Bake at 350F for 10-12 minutes. While warm push eyeballs into the center or all over the cookie. Transfer cookies to wire racks to cool completely. Where can I buy the Buttered Flavored Olive Oil? Can’t find at the Stores where I used to purchase. Please HELP, I love this product. Hello Sandra, thank you for reaching out to us. Unfortunately, this product has been discontinued. We apologize for any inconvenience. I am so upset that the butter flavored olive oil has been discontinued. Will you ever carry it again? Yours was the best and we ordered it by the case. You had the market on it. I sure wish you would reconsider. Unfortunately, the retailers who carried this item discontinued it which is why we had to stop carrying it.